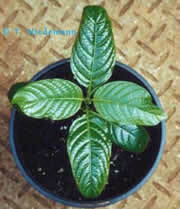 Kratom is a tree native to Southeast Asia (Thailand, Malaysia and Myanmar). Its botanical name is Mitragyna speciosa. The leaves of kratom have been used as an herbal drug from time immemorial by tribes of Southeast Asia. It is used as a stimulant (in low doses), sedative (in high doses), recreational drug, pain killer, medicine for diarrhea, and treatment for opiate addiction. What are the active components in Kratom? Over 25 alkaloids have been isolated from kratom. The most abundant alkaloids consist of three indoles and two oxindoles. The three indoles are mitragynine, paynanthine, and speciogynine - the first two of which appear to be unique to this species. The two oxindoles are mitraphylline and speciofoline. Other alkaloids present include other indoles, and oxindoles such as ajmalicine, corynanthedine, mitraversine, rhychophylline, and stipulatine. In low doses (10 grams) it induces mild euphoria and reduces fatigue. Low doses do not interfere with most ordinary activities, however, one should not drive or perform other activities that require full attention. With strong doses (20-50 grams) the effects are profoundly euphoric and immensely pleasurable. Typically, people describe the effects as dreamy, ecstatic, and blissful. Many people experience closed-eye visualizations. Strong doses must only be used when one is able to devote several hours to the experience itself. The leaves of kratom are grinded and eaten, usually followed by drinking warm water, tea or coffee. Leaves can also be made into a tea, or a crude resin extraction can be made. This resin extract is made by preparing a water extract of the leaves, boiling it dry, and then shaping it into a small ball.